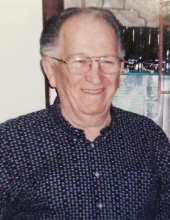 Robert G. Wendtland, age 87, of Richmond was called home to be with our Lord Tuesday, January 29, 2019. He was born March 18, 1931 in Baldwin, Michigan to Gustav and Ethel (Daum) Wendtland. On October 3, 1959 he married his loving wife Doreen Choske at St. Paul Lutheran Church in Round lake. Robert attended Lane Tech High School before entering the U.S. Navy. After the service, he worked for his brother as a painter and was employed by several bakeries before working as a lineman for the phone company. Robert was a loving husband and dad and a doting Papa. He enjoyed all sports, fishing and hunting, puzzles, crafts and spending time in his trailer in Morris, IL. Robert served as a volunteer at Camp Moyoca Moody Youth Camp as well as serving many years as an usher at Moody church. Robert is survived by his wife of 59 years, Doreen; son, Glenn (Susan) Wendtland; three grandchildren, Sandra Wendtland, Sarah (Mark)La Master, and Robert Wendtland. He was preceded in death by his parents, brothers, Kenneth Wendtland, William Wendtland; sisters, Marian Geraldi, Beverly Wendtland. Visitation will be held on Saturday, February 2, 2019 from 9 a.m. until the 12 p.m. funeral service at Thompson Spring Grove Funeral Home 8103 Wilmot Road, Spring Grove, IL 60081. To send flowers or a remembrance gift to the family of Robert G. Wendtland, please visit our Tribute Store. "Email Address" would like to share the life celebration of Robert G. Wendtland. Click on the "link" to go to share a favorite memory or leave a condolence message for the family.